Having a ruck you can count on is vital on building the phases to sustain an attack of any real substance. The best teams in the land will never lose a ruck so develop your team into a unit able to dominate every one. Notch up the phases and grind down your opponents with a secure ruck. The main aim of the session is to develop a team fit to win and secure every ruck in a competitive situation. 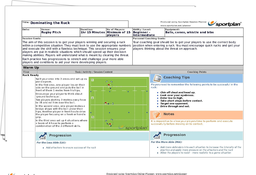 This runs throughout the session as it works on creating numbers plus perfecting the ideal technique. Warm up with some uncontested ruck situations to not only raise the heart rate but to switch on the players minds, getting them to think of positioning and technique from the outset. The technical practices in the body of the session develops players understandings of the benefits on engaging in contact to set up a ruck and progresses by adding in the second and third phase of the attack. The session gradually increases the amount of contact before culminating in a small-sided game designed to encourage dominant rucks. It’s a great opportunity for players to be put under some pressure as any mistakes will be accentuated in the small space. Produce a team that are all on the same wavelength that understands not only the technique to dominating a ruck, but the benefits of a sound ruck on the whole team.